U.S. Soccer filed its response to the NASL's lawsuit in Federal district seeking an preliminary injunction to allow it to keep its Division II status for 2018. The response consists of 1,234 pages of statements and exhibits. It includes a 78-page statement from U.S. Soccer president Sunil Gulaticovering the history of the federation's pro divisions and changes in the pro standards. Briefly ... U.S. Soccer's sanctioning requirements for Division 2 call for leagues to operate with a minimum of 12 teams. The NASL was granted a reprieve to operate with eight only teams in 2017 -- down from 12 in 2016 -- after the New York Cosmos found a new owner -- Mediacom CEO Rocco Commisso -- at the last minute and the league agreed to operate the Jacksonville Armada until a new owner, Robert Palmer, was found, which happened this summer. NASL application. The NASL's application for 2018 also included eight teams. This time, U.S. Soccer's board of directors refrained from extending the NASL's provisional Division 2 status for the 2018 season. Of the eight NASL teams in 2017, NASL interim commissioner Rishi Sehgal advised U.S. Soccer on Aug. 15 that two -- FC Edmonton and the San Francisco Deltas -- had not committed to return. Sehgal said the NASL had six teams committed to return for 2018 -- New York Cosmos, North Carolina FC, Jacksonville Armada Miami FC, Puerto Rico FC and Indy Eleven -- and two new California teams committed in Orange County and San Diego. USSF's position. Gulati's concern was that only five teams that played in the 2017 season -- the six minus North Carolina FC -- had "definitively committed to return to play in the NASL for 2018." He stated that NCFC's bond committed it "to play in 2018 but not necessarily in the NASL" and the NASL did not provide any information on "conformance to the Professional League Standards" by either of the two new California teams. "Given the large amount of turnover in the NASL since its founding and the lack of specific information provided," Gulati responded, "it was difficult to conclude that the NASL would have even 8 teams for 2018 -- the same number of teams as in 2017, still 4 teams short of the Division II minimum of 12 teams, and still with no team proposed for the Central time zone. In other words, at best the NASL had made no progress towards compliance with the Division II standards and, at worst, it had taken a significant step backwards by losing 2 or 3 teams while proposing 2 replacement teams with relatively little information." At the Sept. 1 board of directors meeting, NASL representatives -- Commisso, Palmer and Sehgal -- asked for three years to get its house in order. That was turned down. Sunil-Rocco emails. The USSF's response shows that Gulati and Commisso, the chairman of the NASL's board of governors, were emailing through Oct. 8, two days before the USA-Trinidad & Tobago. Gulati told Commisso and Sehgal the federation didn't want to impair the NASL’s ability to operate as a Division 2 league in 2018, "if it can genuinely do so, but you didn’t have a plan at the Board meeting, and since then, Board hasn’t heard from you – we’ve heard from your lawyers." -- If the NASL could demonstrate by Oct. 20 that it had eight "economically viable and separately-owned teams committed to play in 2018 (obviously they will have to execute the bond) which according to what Rocco has stated in his declaration should not be difficult." -- If the NASL would agree to provide a detailed plan and strategy by Nov. 20 how NASL planned to have "12 economically viable, separately-owned teams for the 2020 season." 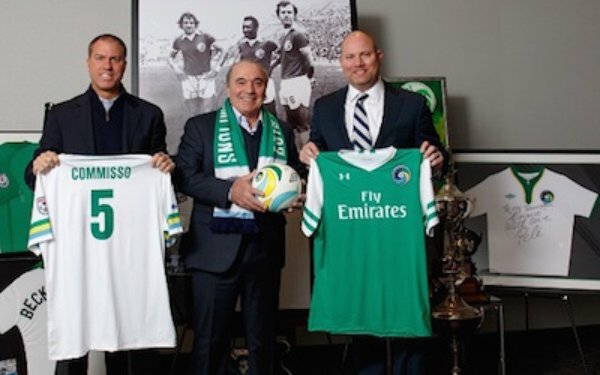 Commisso's response was that Gulati was using "more of the same delaying tactics that only harm the NASL and soccer in the U.S." and the NASL would only listen to a settlement proposal as part of formal settlement discussions around the lawsuit, which also includes a request for a permanent injunction lifting U.S. Soccer pro divisional standards. Next up: NASL's reply on Oct. 23 and the hearing on Oct. 31. 3 comments about "NASL vs. USSF: Court filings show settlement discussions were ongoing". don Lamb, October 18, 2017 at 3:20 p.m.
Fire Paul Gardner Now, October 18, 2017 at 4:07 p.m.
Granted I come at this thinking NASL should lose but the USSF's brief was pretty presuasive. Should be interesting to read the NASL's reply. Apparently the NASL said the time zone requirement for US leagues is unnecessary and cited countries like England and Japan that didn't have it, ignoring that those countries only have has one time zone. James Ritch, October 19, 2017 at 12:16 p.m. The NASL got to their current level of teams due to a not-so-veiled and systemic attack by the MLS to head off any "American Football League" type intervention with the MLS. Garber comes from the NFL where the AFL and USFL issues are fresh in his mind. He knows the formula for cutting out potential upstart leagues. 1. USL is combination MLS expansion/market incubator and farm club. 2. It can easily be assumed that teams like Ottawa and Tampa that abandoned NASL did so as they entertained MLS bids. It could be understood that the MLS expansion committee would look more favorably on your application if you are in the USL. 3. MLS has targeted and landed successful NASL markets. As long as NASL is not allowed to be considered as a "top tier" league on par with MLS, it will always have its owners ready to drop the league and move into MLS.